Exceptionally bad and bears almost no resemblance to the games. Well, I hadn't been expecting Art of Fighting to be particularly exceptional when I first picked up this tape for $5, but I hadn't been expecting it to be this bad. Makosuke pretty much pinned everything down in his review--AoF has bad animation, lame action and a pathetic excuse for a plot. He appeared to kind of like Robert and Ryo because they were so amusingly different, but this is where I really had problems with this anime. You see, when an anime based on a video game turns out to be a rather shoddy product, the only hope of redemption it has is to be able to please fans of the game. 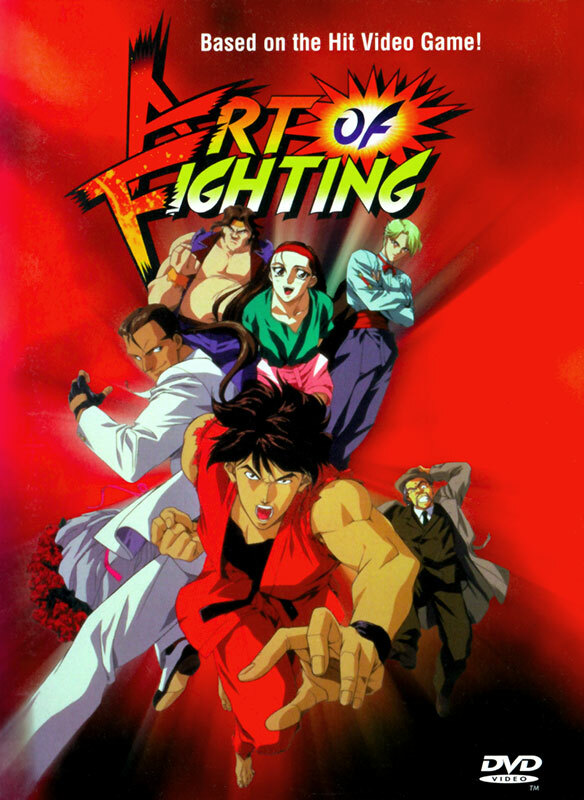 Now, I'm not an Art of Fighting fan (that particular series kind of faded out of existence years ago) but I am familiar with these characters and I know a fair bit about them from King of Fighters. And frankly, this anime just didn't do them justice. I admit that Ryo and Robert's interplay was amusing in a way, but they should have had at least a bit of cool about them, while the closest thing they had was Robert's tendency to try (and fail) to hit on King. Plus the designs weren't entirely accurate to the games either--it's Robert who's supposed to have dark hair and Ryo who's supposed to be blonde. If that wasn't bad enough, Yuri apparently had her personality surgically removed before the anime began to ensure that she wouldn't be anything but a helpless damsel in distress waiting to be rescued, rather than the spunky young karate chick from the games. Ryo and Yuri's father Takuma was totally absent, although it would have been hard to fit him in without giving him one of those awful "gratuitous cameo" roles. Pretty much the only redeeming factor from a fan viewpoint was King, although I'm not sure if she was supposed to be a bad girl, seeing as how she's a close friend of Yuri's by the King of Fighters series. Compare all this to Fatal Fury, which is based on a game by the same guys who made Art of Fighting but is much more faithful to the original (and is, after the first part, of much higher quality). Were there any redeeming features to this anime? Well, yes; police Lieutenant Todoh may have had a terrible English voice actor but he was by far the looniest cop I've ever seen--I've seen Oda in Patlabor, I've seen Britain and the Tank Police in the anime that bears their name, but I've never before seen a policeman do a raid on a casino by riding a demolition ball through the window while wearing a samurai breastplate and a slouch hat and wielding a bokken. Most of the action was lame, especially the appallingly disappointing fight between Robert and King at the end, but the fight in Ryo's apartment wasn't bad. And yes it was amusing at times, like when Robert decides to help himself to the booze while he and Ryo are just searching someone's house for a lost cat. But in all, I was more or less unimpressed by Art of Fighting. I'm not saying that even fans of the game should stay away, but I am saying that it really isn't very good. Maybe get it on a rental if you're desperate or bored, but don't go out of your way for it and don't for the love of God buy it. 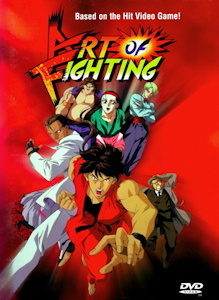 Art of Fighting is Copyright © 1993 SNK / Fuji TV / NAS. English Version 1997 Central Park Media Corporation. Any images are the property of their respective rightsholders, and included for review purposes only under the fair-use clause of US copyright law.